You can customize the settings that control how prescriptions are printed for each location of your organization. On the Settings menu, under Patient Care, click (or tap) Prescriptions. The Prescription Setup page opens. On the Prescription Setup page, click (or tap) Modify Print Settings. The print settings become available. From the Template list, select the state where the providers in your office prescribe medications. The current location's state is selected by default. 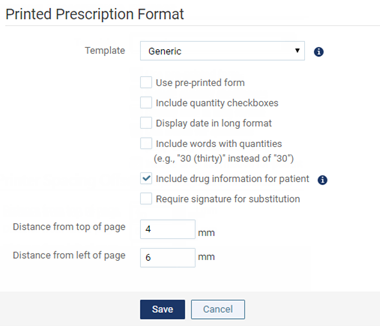 Alternatively, you can select the "Generic" option to specify custom printing options for prescriptions. Set up the options for the selected state's prescriptions or for generic prescriptions as needed. Display date in long format - The date of the prescription appears on the printed prescription with an abbreviation for the month spelled out, the day of the month, and the four-digit year (for example, Jan 15, 2014). With this check box clear, the date appears in a mm/dd/yyyy format on the printed prescription. Include words with quantities - The quantity to dispense appears spelled out on the printed prescription (for example, "twelve" for 12). With this check box clear, the quantity is a number on the printed prescription. Include drug information for patient - Drug information regarding a given prescription prints below the printed prescription. This information is appended to any notes that are entered when the prescription is written. Require signature for substitution - On the printed prescription, there are two signature lines: one for "Product Selection Permitted," and one for "Dispense as Written." With this check box clear, there are check boxes on the printed prescription for "Dispense as written" and "Generic Substitution Permitted," with the applicable check box selected, and a signature line for "Signature of Prescriber." Offsets - Specify, in millimeters, an offset for the top and left margins of printed prescriptions. Negative numbers are allowed. Will Ascend work with ePrescribe in New York?